forever how we experience life and the world. As I was sharing with a friend recently, for me living fully hasn’t been about bunging jumping off a bridge or climbing Mt Everest but about being as present to life as I can be and answering the call of my heart at any given time which has also lead to some unique adventures! Sometimes I have risked my heart for love but isn’t it better to take the risk than protecting oneself for fear of being hurt? The practice becomes learning to embrace it all which is the heart of so many of our spiritual traditions. Grief and praise. One calling in my heart was to travel on pilgrimage to Peru in 2006. I attended a lecture the previous year with writer and environmentalist Terry Tempest Williams who had just returned from Rwanda. Her book, Finding Beauty in a Broken World came out of that experience. She spoke of her journey to Africa in the wake of her brother’s death and her initial resistance in going because of her profound grief. She went on to say, “We can never know where we are called and we can not deny our own evolution or education.” Those words and her journey inspired me and felt that it was a message to answer my own call which I had been contemplating for some time. When I returned home, I emailed my confirmation to travel with dear friends from Canada who have a deep connection to Peru and a community there who are sharing the ancient Andean wisdom of the Q’ero with those of us in the North. It was a meeting of the Eagle and the Condor as foretold in the prophecy of the same name. It was a deeply meaningful journey for me and the teachings continue to inform my life, spiritual practice, and art, as you can see from my new painting shown here. The Andean people are so innately connected to their cosmology and express reverence and gratitude by making offerings of cocoa leaves to the water, to the earth, or an Apus (Mt Spirit) as they journey through their day. At the ruins of Tipon, our guide poured a little touch of water from his canteen on to the Earth before drinking. Our Q’ero teacher did the same. 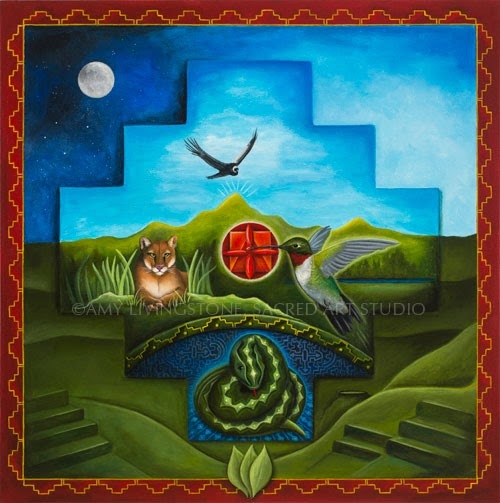 Giving thanks to Mother Earth, Pachamama, for her sustaining ALL life on this precious planet. Very simple. As we gather to share in the love of family and friends this Thanksgiving day, may we remember the gifts we receive from the Earth. May we honor both the dark and the light. May give thanks for the bounty and beauty that abounds in this season of life! Munay (MOON-eye) means love in Quechua the native language of Peru and is the first principle of the Andean spiritual path (knowledge and action being the other two). Munay is an all-encompassing love that also signifies tranquility and beauty. Pachamama is Earth Mother in space-time. The Inka Cross (or Chakana) is an ancient symbol with very complex cosmology and symbolism woven throughout. Here, it was the spirit guides representing the three realms that came forward in my vision. The condor representing the Hanaq Pacha (the upper world of spirit), the puma representing the Kay Pacha, (the world of our everyday existence) and the serpent representing the Ukhu Pacha (the underworld or unconscious). The hummingbird is also revered in the Andes as a symbol of joy, beauty, and resurrection. 16×20″ archival-quality art prints available.